Android seems to be taking over the world right now, with good reason to. Â Everywhere you turn from mobile phone stores, department stores and even supermarkets you can get your hands on some form of Android device. Â I currently have a Samsung Galaxy S2 which I love. Â The one thing I was missing was a tablet that offered me the flexibility that I craved, my iPad2 which I have to admit is a awesome bit of hardware falls somewhat short in many areas. 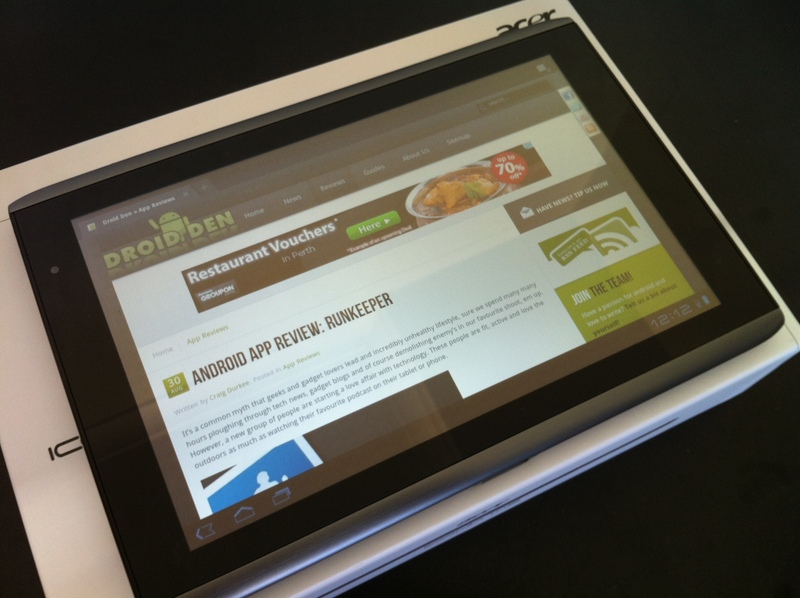 I have wanted a Android Tab for a while now and have been browsing the likes of eBay, local classifieds and stores for what seem like forever. Â Then just buy chance I spotted an offer in my local Electrical Store offering the unit for a$388. Â I had to investigate further. Â I knew that another local store offered a price match policy and if they were more expensive would match the price and a 5% difference to get the sale. Â Money in hand I parted with a$366 (238 UK Pounds, $375 US) Â a total bargain in my eyes. Anyway, the tablet. Â It runs Android Honeycomb 3.1 after an immediate update and I really fell in love with the OS, its fast, vibrant and very easy to customise to your exact needs. Â However this is not a review of the OS as I am sure you are all aware of how that works. Â The unit is a fairly chunky unit and feels heavier than my iPad2, though this feels reassuring, tough almost built to a very high standard compared to the Apple product I loved so much. The front is as you would imagine a sheet of glass surrounded by a bessel, in this case a rather large one. Â The quality feel is once again present as the top and bottom of the unit features a brushed aluminium section which wraps around from the back. Â The back is gorgeous. The brushed finish feel nice in hand and although I fear it may mark and scratch over time I really don't care. Â I would not change it in any way. Â You'll also fine a set of stereo speakers and a 5 megapixel Camera. The sides of the unit feature all the IO ports. Â There are plenty to choose from. Â We have a full size USB port and a micro USB, the full size USB accepting Â USB keys, keyboard, mouse, dam you can even connect a 1TB HDD up and watch movies from it. Â Is there nothing this Tab can't do. Â There is also a Â micro HDMI for watching movies on the big screen, would have been nice to have seen a full size HDMI port but eBay offer cheap enough adaptors should you not be able to find one locally at the right price. Â Headphone and power connections also feature, giving you the full compliment of required ports. One gripe is that the power cord as well as being very short is not a USB charging cable, this could prove a pain if you spend all day out on the road like I do, access to a mains charger is not always an option for me. Â Although battery time has been very good and so far charging in-between the working day has not been required. The camera's are ample and some might say even pretty good. 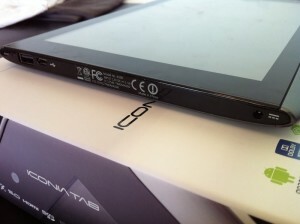 Â Certainly trumps the offering from Apple and I think better than most of the other tablets I have seen so far. Whilst Video is also smooth and very watchable when viewed on my 55inch LCD. The screen is bright and vibrant in most conditions, even using it in the Australian sun proved no problem, you guys in the UK will be fine :) Â I use it mostly in the car instead of booting up my company Thinkpad and it has certainly increased my productivity. No booting times and the easy link up to my mobile via wifi tethering saves me so much time. There are also plenty of hardware options for the unit, including a bluetooth keyboard, laptop style dock and also a multimedia dock, not to mention a whole stack of official and 3rd party cases. Â I can seriously see myself outlaying for the keyboard dock very soon as using the tab with a keyboard is an absolute joy.